Ever feel as if your congregation doesn't remember on Monday what you preached about on Sunday? It is important for those of us who hear the preaching of the Word, to meditate on it and apply it into our lives. And if the church can provide tools and resources to further that goal, we should make every effort to do so. That is why I like what College Park Church is providing. 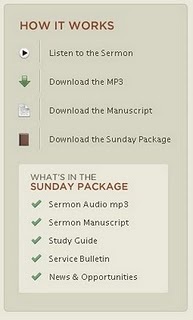 They are making available on their website a 'Sunday Package'. In the package is the sermon to listen to again, a manuscript of the sermon, a study guide, as well as the weekly church bulletin and news and opportunities. I think this is an awesome idea, and as far as I can see, it isn't very difficult to implement.